It's funny to think that I used to confuse Peter Cushing with Christopher Lee, and vice versa. I can't even imagine making such a blunder now...but then I suppose we are all young and foolish at one point or another. Don't worry, I've known which is which for many years now, and love them both for their similarities as well as their differences. Written in an easy, conversational style, it feels natural to read the book in his voice (kind of like we all do with Morgan Freeman and Christopher Walken, right?) 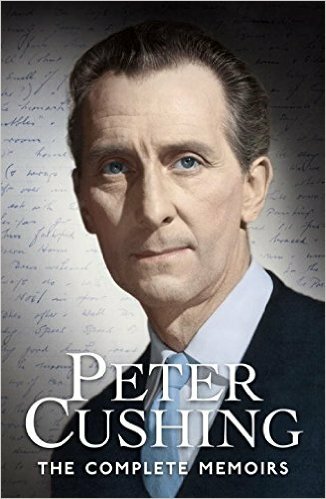 Not only do we get a complete back story of his childhood, bouts of ill health and struggling actor years, he also gives us a generous detailing of his private life with his beloved wife Helen. All with a perfect English gentleman's grace. Check it out from your local library or buy a copy on Amazon (that's were the above link will take you), but do yourself a favor and come to know this extraordinary human being better than you thought you ever did. Thank you, dear Peter, for sharing your legacy with us.